Another masterpiece by Paul Nolan, made from roohide, 12plt downto 6plt. 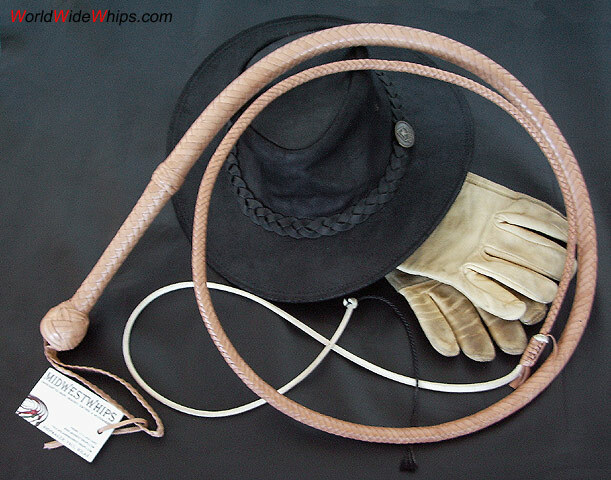 Like the big one (see Indiana Jones bullwhip (10ft) by Paul Nolan) this whip has a concave handle (also called hourglass handle), which fits well into the hand. This whip is not just shorter than the 10ft one, but perfectly scaled down, i.e. the handle length and the diameters of knots, thong and handle are a bit smaller. This gives the whip an elegant appearance.